Optimum Body Position Principle of HKB Wing Chun [Facing]. HKB Hoat Keng [Impulse Power] through Shaolin HKB Sam Chian Po's Detachment Concept. Free Flow Niam Jiu[Sticky Hand]. Sam Chian Po Section: 3 Battle Step. Siauw Liam Dou: Little Training. HKB Advanced Hoat Keng [Impulse Power] through Shaolin HKB Sam Chian Po's Detachment Concept. 2 Tier Trapping Niam Jiu[Sticky Hand]. Advance Sam Chian Po Section: 3 Battle Step. Advance Siauw Liam Dou: Little Training. Ti Saam Chian Po Section: Earth 3 Battle Step. Tim Kiao Section: Sinking the bridge. 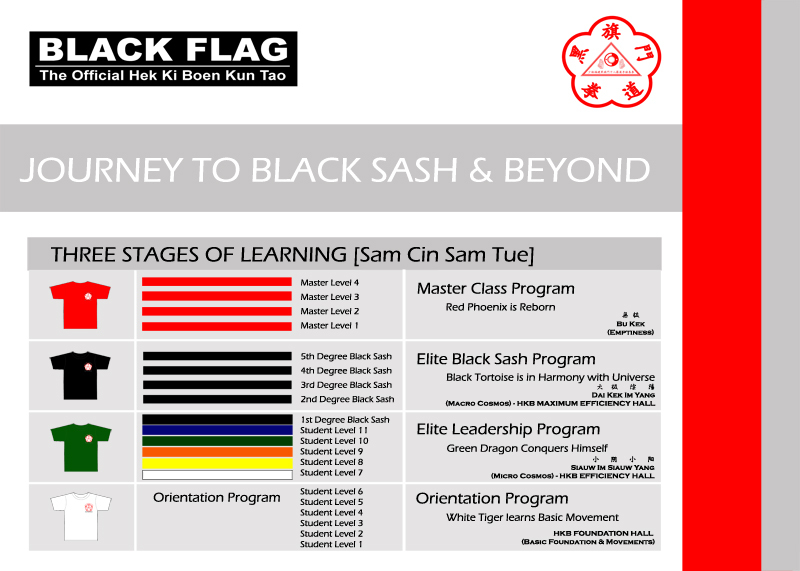 HKB 1st Degree Hoat Keng [Impulse Power] through Shaolin HKB Sam Chian Po's Detachment Concept. Free Flow and 2 Tier Trapping Niam Jiu[Sticky Hand]. Keys to Engagement, Motivational and Empowerment. HKB 2nd Degree Hoat Keng [Impulse Power] through Shaolin HKB Sam Chian Po's Detachment Concept. Five element type of Energy set-up and other advance skills.